Fran has been adopted and gone to a wonderful new home. Thank You again for continuing to support our goal of rescuing all the needy animals that we can. Fran is a shy little girl who came from a puppy mill closing. We are fostering her for the National Brussels Griffon Rescue, Inc. until she goes to her “furever” home. Fran is about 1-2 years old. 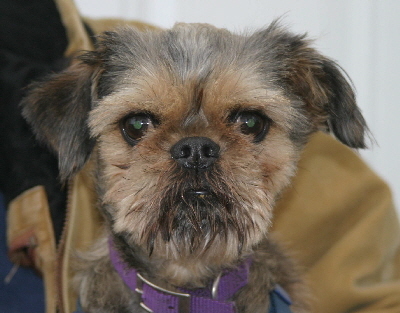 Fran was one of six received by Brussels Griffon Rescue. Her entire purpose in life was to breed puppies for profit. Until the puppy mill closing she had never seen the light of day. When we received her she was afraid of people, especially men. When placed outdoors she was even afraid of grass and didn’t know what the outdoors was. When given a dog toy she had no idea what it was. She barked at it! Fran now sleeps in bed with us and has learned how to socialize. She has learned that life is good and toys are lots of fun to play with. Fran is on her way to a new permanent home. Thank you for your support of our soap sales. Through your purchases we can foster this dog.